Motor oil is what’s used to keep the parts inside of your MINI Cooper’s engine lubricated and cool. Over time, the oil can get dirty, causing those parts to heat up and grind against each other. If left untreated, this could cause the engine to malfunction down the road, eventually requiring a replacement if left too long. However, by getting a MINI Cooper oil change at regular intervals, you shouldn’t have to worry! Below, we’ll explain how to determine when this type of service is warranted. Then, you can contact MINI of Annapolis to get an oil change near Annapolis, Highland Beach, or Hillsmere Shores! The MINI Cooper is designed to let you know when an oil change is needed. The vehicle comes with a Central Information Display (CID) that shows important information, including necessary service. You’ll then select an entry to get detailed information. If you see OK on the screen, no service is currently required. A triangle, meanwhile, means that the deadline for scheduled maintenance is approaching. Finally, a small, dark triangle inside of a bigger one means that the service deadline has already passed, so you’ll need to get an oil change very soon if you haven’t done so already. A great way to know if your MINI model is running low on oil is to simply check the Control Display on the dashboard. For instance, if you see what looks like an oil can displayed in red, then you know the engine oil pressure is too low. The level will then be displayed. An ideal time to check this is after you do about 30 minutes of normal driving, as you’ll get a more accurate reading. The level will then be checked and shown on the screen via a scale. If you see that the engine oil level is too low, you’ll want to add more oil as soon as possible. 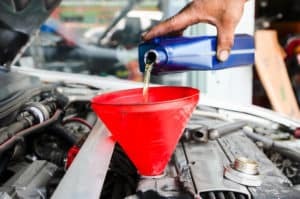 While getting an oil change at the right time is crucial, it’s just as important to use the right type of oil. The wrong type of oil could cause the engine to malfunction, leaving you without a working automobile. If these types aren’t available, you can use up to a quart of an engine oil with a rating of API SL, SM, or SN. It should also have a viscosity grade of SAE 0W-20 or SAE 0W-30, as this will help the engine stay healthy for a long time. If you find that your MINI Cooper needs an oil change, let the experts at MINI of Annapolis help. 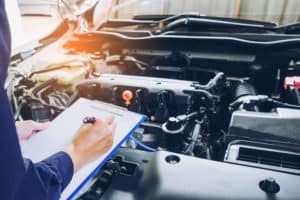 Our certified technicians have years of experience performing this type of maintenance, and as a result, they can get the work done quickly and efficiently. Plus, they have access to all kinds of oil, so they can easily use the right type for your model. Don’t wait—schedule an oil change near Annapolis, Highland Beach, and Hillsmere Shores today!